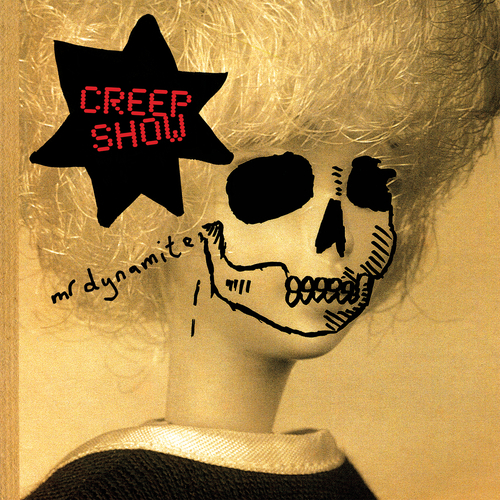 Creep Show brings together John Grant with the dark analogue electro of Wrangler (Stephen Mallinder / Phil Winter / Benge) to create Mr Dynamite – a debut album packed with experimental pop and surreal funk. 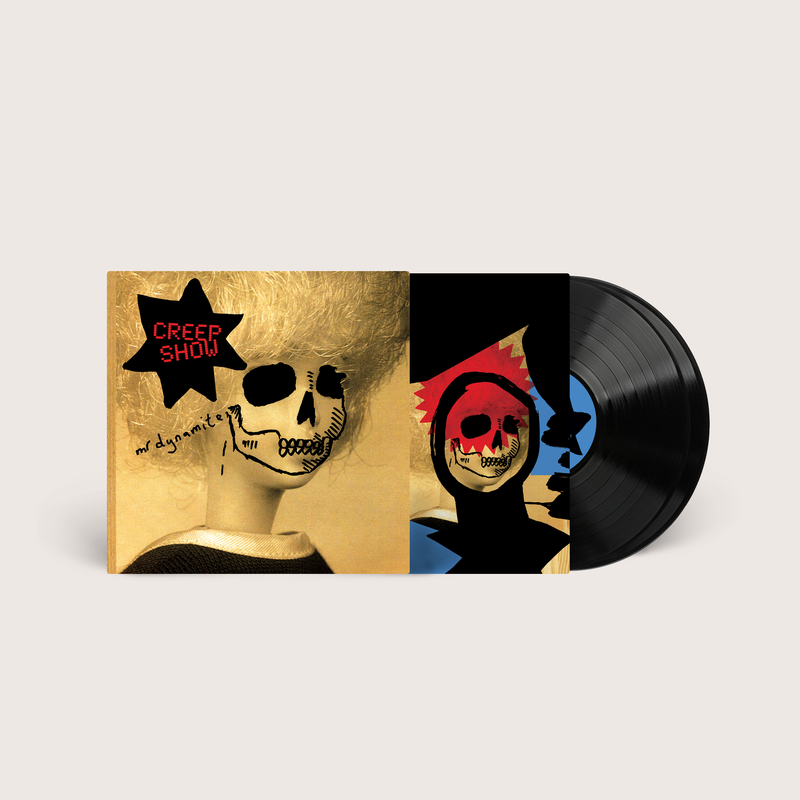 Recorded in Cornwall with a lifetime’s collection of drum machines and synthesisers assembled by Benge and explored by every member of Creep Show, there’s a real sense of freedom in the shackles-off grooves, channelling the early pioneering spirit of the Sugarhill Gang through wires and random electric noise. John Grant and former Cabaret Voltaire frontman Stephen Mallinder, who switch between oblique wordplay to sinister humour as Phil Winter and Benge continue to man-handle the machines. “Creep Show is Hydra,’ says Mallinder. ‘A beast with multiple heads and voices, so no one is quite sure who is saying and doing what. Everything is permitted and everything is possible.’ Grant: ‘I do like theatre of the absurd and some of it is that, but most of it is just having fun. We did a lot of laughing and just had a blast doing it.’ The creepy ‘alter-ego’ title track, ‘Pink Squirrel’’s vocoder kaleidoscope and Grant’s exhilarating croon on the nine minute ‘Safe And Sound’ are just some of the twists and hooks to be explored on this consistently inventive record. Wrangler are no strangers to collaboration. In the studio they’ve teamed up with LoneLady, Tom Rogerson (currently working with Brian Eno) and Serafina Steer on their albums La Spark (2014) and White Glue two years later. As well as remixing Primal Scream, Gazelle Twin and John Grant (on ‘Voodoo Doll’), in 2015 they released a double LP of Modular synthesiser remixes entitled Sparked which included new takes on their music by Daniel Miller and Chris Carter (Chris & Cosey). Cotton Panic!, a forward-looking stage production commissioned by and performed at the Manchester International Festival in 2017, was the result of Wrangler joining forces with actor Jane Horrocks and writer Nick Vivian. Grant too enjoys working with other artists, sharing stages and songs with the likes of Elbow, Susanne Sundfør, Hercules & Love Affair and Tracey Thorn. His passion for electronic music – including Cabaret Voltaire – has influenced his last two albums Pale Green Ghosts (2013) and Grey Tickles, Black Pressure from 2015, eventually leading him to Wrangler’s sequencers and wonky drum machines. And it’s a spirit that wants to dance. For every weird, esoteric mood and texture explored there’s always a beat and a fresh sense of adventure, whether through the Space Invader electro of ‘Tokyo Metro’, squelchy synth-funk of ‘Modern Parenting’, the warped, experimental arc of ‘Endangered Species’ or ‘Lime Ricky’s ferocious breakbeat workout. On ‘K Mart Johnny’ ripped-up, distorted sounds and sinister voices accumulate on the cold electronics like flies on neon, but the rhythms and synth stabs still propel it forward, in this case into a bizarre story of childhood name-calling and revenge centred around a yellow-spotted toy dinosaur. The album ends with two of the longest tracks – the beautiful Kraftwerk-in-space, pristine but cosmic ‘Fall’ and the Moroder-esque odyssey, ‘Safe And Sound’. The latter is a brilliant climax to the album, Grant’s vocals at their most opulent and moving as he carries us all into the future with the words, “Billions of stars across oceans and time . . . I’m safe and sound in the arms of my destiny”. Unfortunately at this time we can't offer all the Creep Show - Mr. Dynamite tracks as individual wavs, as some of these tracks exceed the shops maximum (9mins) download length.